I decided to mix things up a little this week. Partly owning to no Easter post (I spent most of Easter afternoon and evening catching up on sleep), and partly due to a couple hours I spent train watching (and by “train watching”, I mean sitting in the car, surfing the internet on my “mobile device”) this afternoon. 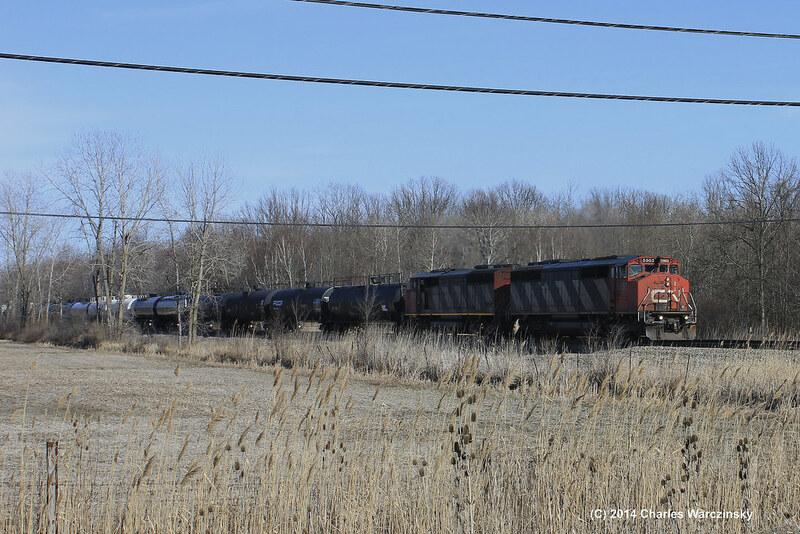 While I was eating lunch this afternoon, I started to see reports that NS 1074, the Lackawanna heritage unit, was on CN train 394, a Chicago to Toronto train that comes through town. 394’s timing this afternoon was such that it hadn’t arrived by the time I got out of work, and I was able to stop at home, grab my camera and head for the railroad. I figured I’d sit at Amtrak and wait for it to crawl by into the tunnel, giving me lots of time to grab a couple decent photos. 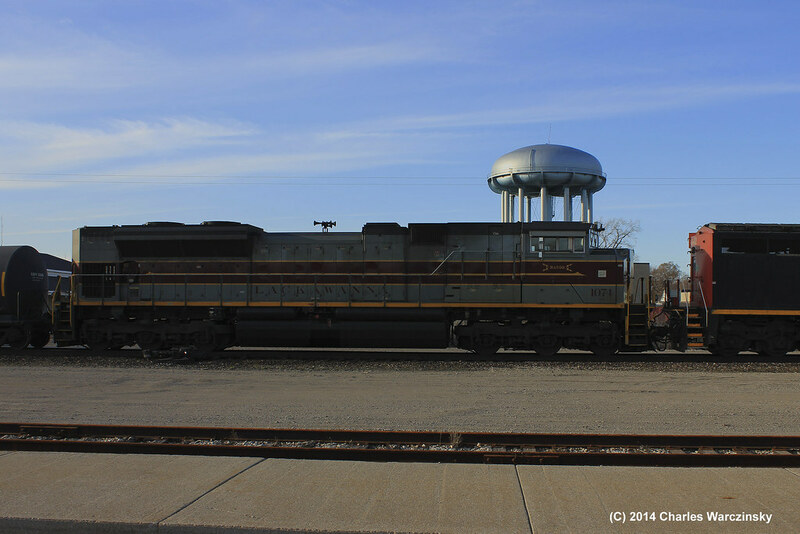 Long before I made it to 16th Street/Amtrak, as I approached West Tappan (the end of the double track that extends west of the yard at Port Huron), the crossing lights started flashing and the gates came down. I instinctively reached for my camera and rolled my window down, expecting to take a quick shot across the road of the 1074. 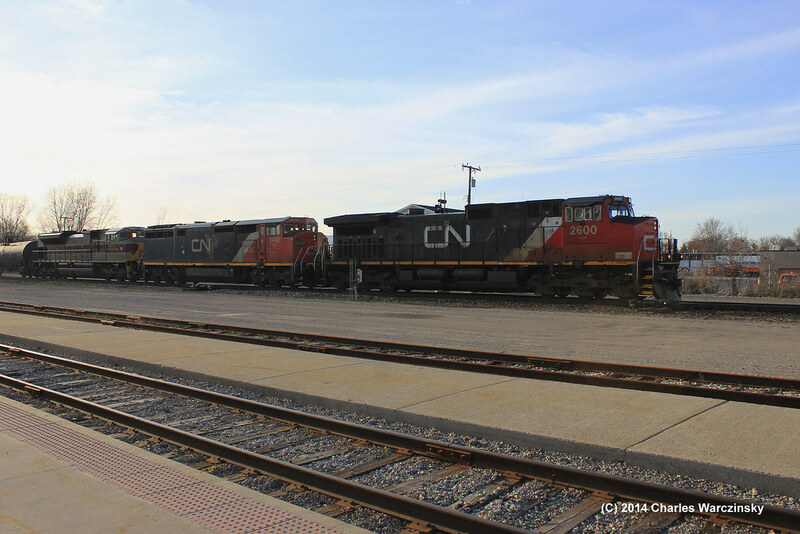 A quick glance to the east though revealed a westbound train with a pair of zebra-striped cowl units [CN 5503(F), CN 5519(R)]. 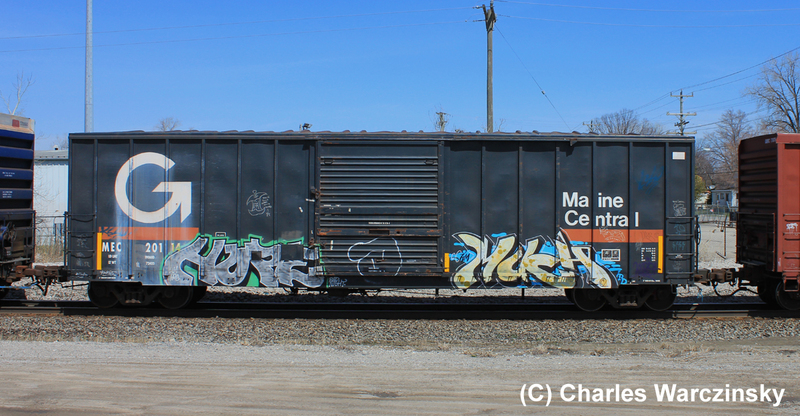 As the train rolled by, several loaded (automobile) frame flats identified this train as 501. Knowing that 501 was going west meant that 394 couldn’t be any closer than Emmett, the first siding west of West Tappan, and gave me plenty of time to take the scenic route to Amtrak. After arrival at 16th Street, I eventually made my way to the back of the parking lot, where I figured I had the best opportunity to get at least one decent broadside shot of the 1074. Sam and Billy, who caught 394 west of the yard on its way in, eventually pulled up and we chatted for a few minutes, then they returned to the east end of the lot, where Sam figured the best photo angle was. After a crew change and time for the new crew to settle in, 394 got the light to head east to Canada. 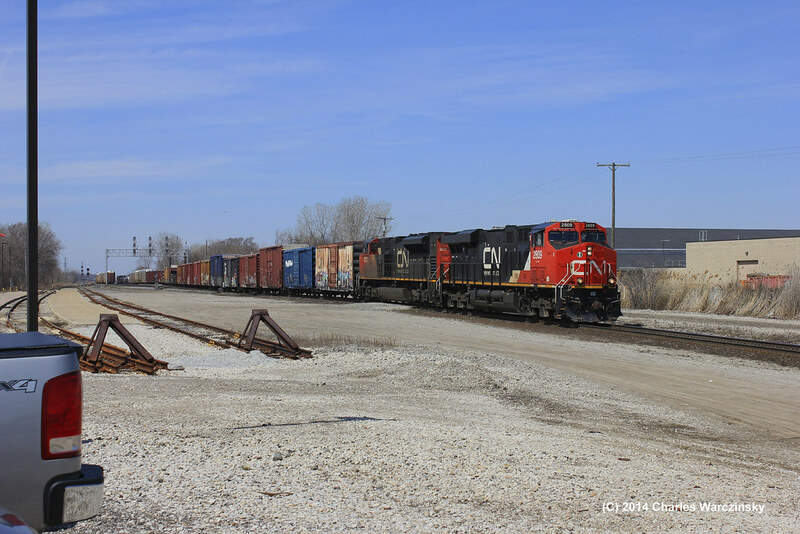 The lead unit, CN 2600, wasn’t very impressive. Just another Dash 9 or something. 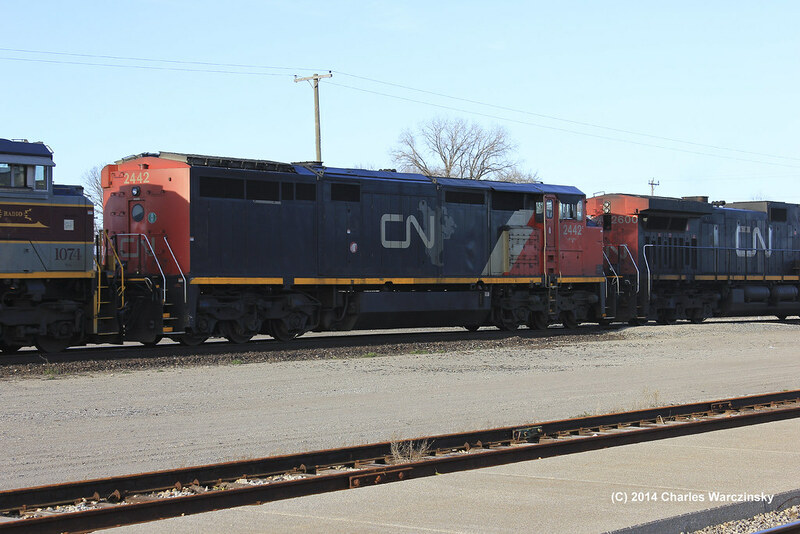 The second unit, CN 2442, is mostly unique to CN, a Dash 8-40CM, I believe. 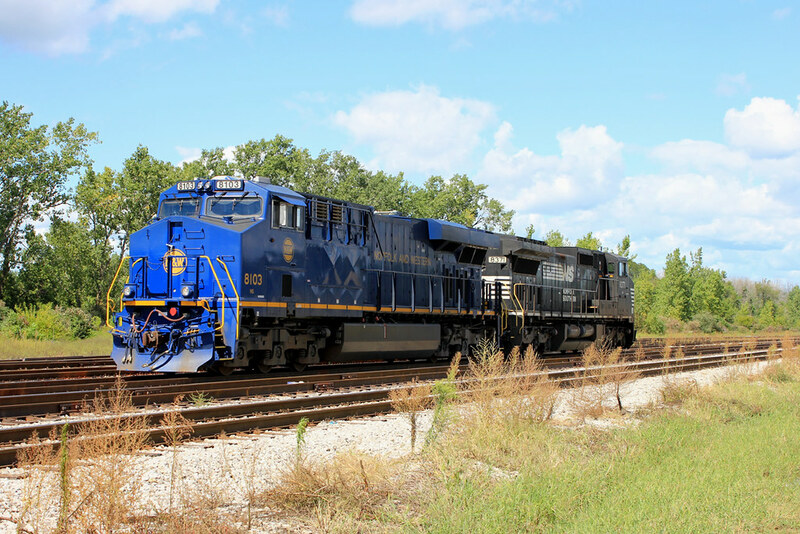 The third unit was the NS 1074. 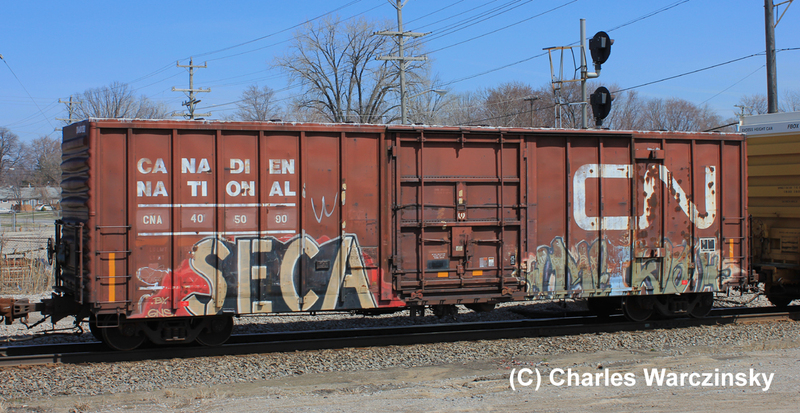 There were a couple other neat cars, including a blue Pan Am boxcar with Boston & Maine reporting marks, but I thought these were the most interesting cars. I’m not going to get into the details of how you can model this car, but it fits in with my attempts to use printed and cut vinyl instead of paint and dry transfers, which is an ongoing project I’m working on. That’s all for this post, enjoy!